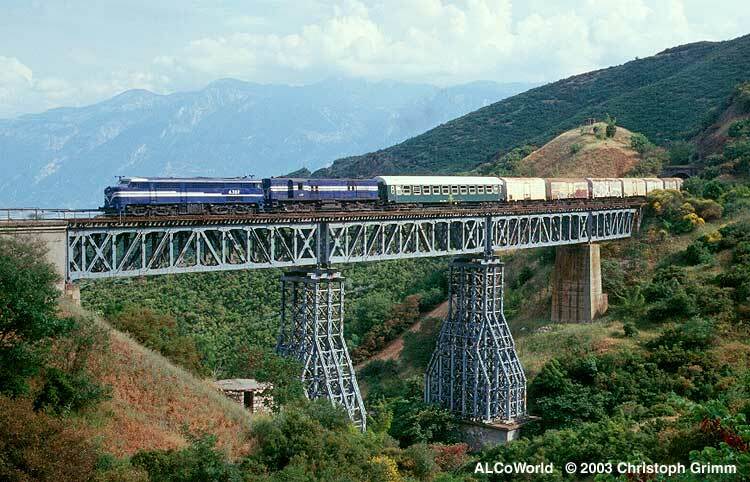 A-302 and A-325 with a freight special on the Karia bridge, May 25th, 2003. The days in revenue service of the literally world famous cab units are over. Though the DL500C's got major overhauls in the Lefkas works in Pireus during the 1st half of the 90s, the last serviceable one, A-302, was withdrawn from revenue service at the end of 1998. The DL500s were assigned to Thessaloniki in their final years, hauling trains mostly in northern Greece. 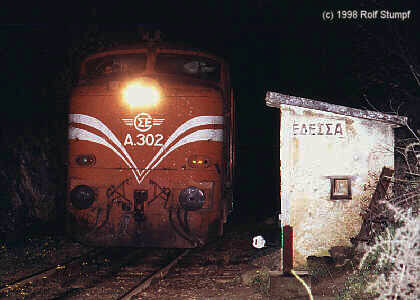 If there was lack of power they reached with express trains even Athens, as happened in January 96! 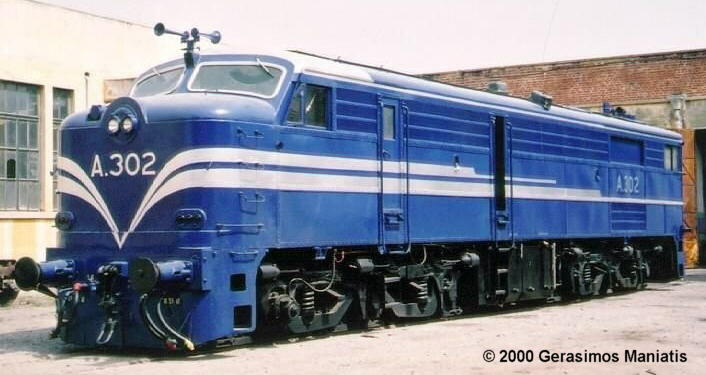 The Greek DL500C were originally painted in dark blue with silver stripes, but during the 1980s they were painted orange and white yet leaving the same striping scheme. Three units were scrapped due to wrecks, which left seven on the roster into the 1990s. The last active unit was A-302 and this will be preserved. A-308 was the 2nd to last active DL500, it swapped its good trucks with A-302 in 1998 and was then dragged to Athens for storage. In June 2000 A-308 was seen inside the Pireas shops for part stripping. The remainder of the fleet (A-303, 304, 306, 308, 309, 310) was/is stored in the storage yard at Athens Aghios Ioannis. Who's blinding who? A-302 (The Beast) roars with train 727 out of Edessa, April 10th 1998. 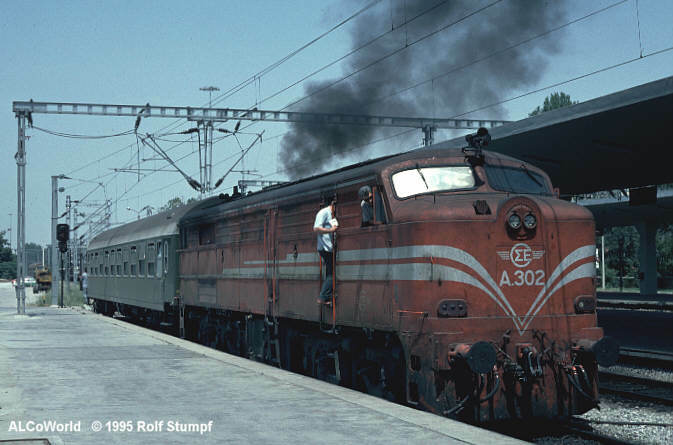 A dramatic scene recorded on digital tape and available on the CD "ALCo Power in Greece"
A-302 was painted in the old livery by Greek railfans. Status as of April 16th 2000, Thessaloniki depot. It saw service with several specials since. As it seems, the unit will be preserved operational. World Locomotive A-302 arriving with train 720 from Kozani at Plati, at right A-558 is waiting with late running #501 (over one hour!) to leave for Athens, July 7th, 1997. Both classes are withdrawn meanwhile! 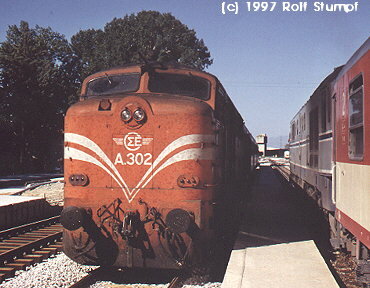 A-302 shunts a bad order car at Thessaloniki after arriving from Kozani on June 25th, 1995. My first encounter with a live DL500!